Hyposalivation results in poor oral health and negatively affects patients’ quality of life. The most prominent cause of this condition is primary Sjögren’s Syndrome (SS), an autoimmune disease that affects salivary and lacrimal glands, but it can also result from a wide variety of oral and systemic diseases, such as diabetes, depression, fibromyalgia, and HIV/AIDS, in addition to iatrogenic causes such as radiation therapy, chemotherapy, and drugs. Current treatments for hyposalivation include: a) saliva substitutes which only provide temporary relief, b) systemic therapies such as cholinergic secretory agonists which are hampered by side effects and contraindications, and c) other experimental therapies (example: gene therapy, electrostimulation) that are either not sufficiently effective or require residual secretory levels. An additional treatment option is the implantation of a bioengineered artificial salivary gland. Current research investigates a variety of growth substrates but is limited to salivary gland primary cells and cell lines, while other cellular components necessary for proper salivary gland function are lacking. For example, salivary gland innervation is essential for proper secretory function, given that saliva secretion is initiated by acetylcholine release from post-ganglionic neurons to activate muscarinic type 3 receptors in acinar cells, leading to fluid secretion. Understanding neuron-salivary epithelial cell interactions is an important step for the development of a viable artificial salivary gland. One valuable approach to study cell-cell interactions is the use of co-cultures. Neurons have been shown to thrive in co-culture with endothelial cells and skeletal muscle cells, and while the role of parasympathetic innervation of salivary glands has been investigated in embryonic submandibular organ explant cultures, no studies to date have investigated co-cultures of neurons and salivary epithelial single cells. In order to develop an in vitro model to study functional interactions between neurons and salivary epithelial cells, the following conditions have to be demonstrated: 1) ability of cells to thrive when cultured together, 2) that neurons do not cause salivary epithelial disruption, or vice versa, and 3) ability of neurons to localize on the basolateral surface of salivary epithelial cell clusters. The main goal of this study was to verify the existence of precursor conditions under which co-cultures of neuron-salivary epithelial cells physically organize in a similar fashion to native tissue. Specifically, our in vitro model is a co-culture of primary mouse cortical neurons (m-CN) and a salivary epithelial cell line (Par-C10) cells. The Par-C10 immortalized cell line was derived by Quissel et al. In 1998 from rat parotid gland acinar cells by transformation with simian virus 40, and at high passage numbers, i.e. 40 - 60, exhibits many characteristics of freshly isolated acinar cells[10,11]. Par-C10 cells have been widely used as a model for studying salivary gland epithelial integrity. Particularly, they form a polarized epithelium when grown on permeable supports and on Matrigel and are able to respond to salivary secretory agonists[4,12-15]. Primary neurons have been used extensively to create in vitro models of the nervous system. Our findings indicate that m-CN were able to self-organize basolaterally to salivary epithelial cell clusters in a similar manner to what occurs in native tissue. We propose that this model can be developed as a potential platform to study neuron-salivary epithelial cell interactions in vitro for the purposes salivary gland bioengineering applications. Submandibular gland extractions were performed on C57BL/6 mice for tissue analysis. The animals were anesthetized via intraperitoneal (IP) injection with 80 to 100 mg/kg ketamine and 5 mg/kg xylazine, and euthanized by abdominal exsanguination. SMG were then removed and snap-frozen and sliced into 5 μm-thick sections. All animal usage, anesthesia, and surgery were conducted with the approval of the University of Utah Institutional Animal Care and Use Committee (IACUC), in accordance with their strict guidelines (IACUC protocol number 14-06012, June 26th 2014). The growth substrate was prepared by mixing growth factor reduced Matrigel (GFR-MG) (Becton Dickinson Labware, Franklin Lakes, NJ) at a 3:1 ratio with DMEM/Ham’s F12 (1:1) serum-free medium (Hyclone, Logan, UT). Ninety microliters of the diluted GFR-MG were placed in each well of a sixteen-well chamber mounted on #1.5 German borosilicate coverglass (Grace Bio-Labs, Bend, OR), and allowed to solidify for 1 h in a 37°C incubator with 95% air and 5% CO2. Par-C10 cells (passage 50 - 60) were prepared from a confluent flask. m-CN (Life Technologies, Carlsbad, CA) were prepared according to the vendor’s protocol immediately before plating. Cells were placed on GFR-MG conditions as follows: 1) Par-C10 cells only (7000 cells/cm2), 2) m-CN cells only (50,000 cells/cm2), and 3) Par-C10 (7000 cells/cm2) and m-CN cells (50,000 cells/cm2) added simultaneously. Par-C10 cells plating density was chosen based on prior studies showing formation of polarized salivary epithelium when grown on GFR-MG. For m-CN, we chose the plating density from a range of values reported in previous studies[17-19]. Plated cells were cultured for 4 days in a 37°C incubator with 95% air and 5% CO2, with medium replacement every 48 h as described previously[13,14]. The growth medium composition is detailed in (Table 1). Cell growth was monitored using phase contrast imaging with an EVOS XL Core light microscope (Thermo Fisher, Waltham, MA). Cells on GFR-MG as well as frozen sections from mouse SMG were fixed in 2% paraformaldehyde for 10 min at room temperature, incubated with 0.1% Triton X-100 in phosphate buffered saline (PBS) for 5 min followed by incubation with 5% goat serum for 1 h at room temperature. Antibodies were all diluted in 5% goat serum prior to incubation. Cells were incubated overnight at 4°C with rabbit anti-ZO-1 (1:200 dilution; Invitrogen, Carlsbad, CA) and mouse anti-β-3-tubulin (1:500; Abcam, Cambridge, MA), then washed three times with PBS, incubated for 1 h with AlexaFluor 488-conjugated goat anti-rabbit and AlexaFluor 568-conjugated goat anti-mouse (both 1:500 in 5% goat serum; Sigma, St. Louis, MO), washed three times with PBS, and stained for 10 min with TO-PRO nuclear stain (1:5000 dilution in PBS). Immunofluorescence images were obtained using a Zeiss LSM 700 confocal laser-scanning microscope (Carl Zeiss Microscopy, Thornwood, NY). Cell cluster diameter was measured using ImageJ software (National Institutes of Health, Bethesda, Maryland). Unpaired two-tailed t-tests were used to determine whether there is a significant difference in: 1) size of Par-C10 cell clusters in single cultures vs. co-cultures, and 2) size of Par-C10 cell clusters with m-CN vs. no m-CN in co-cultures. Data shown are means ± S.E.M. of results from three experiments, where P values < 0.05 were considered significant. 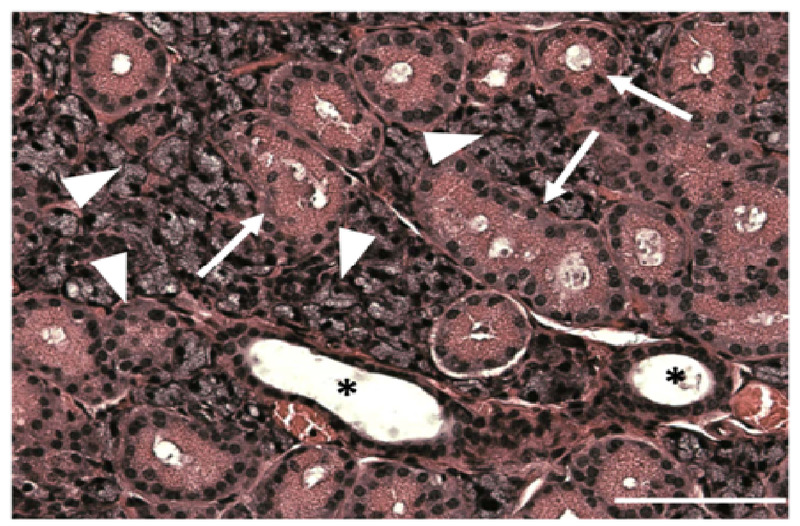 Sections from mouse submandibular glands displayed typical salivary structures in tissue sections stained with H&E, including acini, striated ducts, and excretory ducts [Supplementary Figure 1]. Using structures identified by H&E staining as a reference, we were able to identify the same salivary structures in immunofluorescence images. As shown in (Figure 1A), we observed apical ZO-1 (green) lining luminal spaces in acini (triangles), striated ducts (arrows), and excretory duct (asterisk), indicative of healthy salivary gland tissue. ZO-1 is part of a multiprotein complex present on the apical surface of both acinar and ductal structures in all major salivary glands, and is important for proper saliva secretion[20,21]. We also observed non-uniform expression of β-3-tubulin (red) around acinar and ductal structures, exhibiting higher intensity nodes with lower intensity projections towards the basolateral epithelial surfaces, as shown in (Figure 1B and Figure 1C) shows cell nuclei, while (Figure 1D) shows an overlay image. The non-uniformity of β-3-tubulin can be better visualized around acinar structures at 63×, where some acini, identified by apical ZO-1 staining (Figure 2A and 2E), will only show diminished neuron staining on one direction the basolateral side (Figure 2B and 2F). (Figure 2C and 2G) show cell nuclei, while (Figure 3D and 3H) show an overlay image. β-3-tubulin is a microtubule protein from the β-tubulin family expressed exclusively in central and peripheral neurons, and has been used as a neuronal marker in a variety of in vitro and in vivo studies[23,24]. The observed pattern of β-3-tubulin staining indicates a branching neuronal morphology typical of the salivary gland, which can explain the non-uniformity of β-3-tubulin staining as innervation of salivary structures by progressively fewer numbers of neurons as the salivary structures get smaller. Our findings are the first report on overall neuronal distribution using confocal microscopy within the adult salivary gland for the purpose of developing an in vitro model. Figure 1: Native salivary gland tissue exhibits neuronal organization around salivary epithelial structures. Immunofluorescent images taken at 20× magnification reveal a distribution of neurons on the basolateral side of salivary epithelial structures, including acini (triangles), striated ducts (arrows), and excretory ducts (asterisks). Scale bars are 20 μm. (A) ZO-1 (green) is observed lining luminal spaces in acinar and ductal structures. (B) β-3-tubulin staining (red) indicative of neuronal cytoskeleton is distributed basolateral to epithelial structures. (C) TO-PRO (blue) staining indicates cell nuclei. (D) Overlay image. Immunofluorescent images taken at 63× magnification reveal a highly non-uniform distribution of neurons on the basolateral side of acini (arrowheads indicate lumens). Scale bars are 20 μm. (A&E) ZO-1 (green) marks the apical surface of acini. (B&F) β-3-tubulin staining (red) is distributed in a non-uniform manner around the basolateral surface of acini. (C&G) TO-PRO (blue) staining indicates cell nuclei. (D&H) Overlay images. (A) Par-C10 cells grown on GFR-MG form salivary cell clusters with apical ZO-1 (green) staining. (B) m-CN cells, exhibiting β-3-tubulin (red) staining, grown on GFR-MG form cell monolayers. (C) Phase contrast image showing Par-C10 cells forming polarized salivary epithelial structures of various sizes with hollow lumens, and individual cells on the basolateral side. A cell with visible processes, indicative of an m-CN, can be observed (arrow). (D) Par-C10 and m-CN co-cultures form organized salivary cell clusters surrounded by basolateral m-CN (three-dimensional view). (E) A cross-section of a Par-C10 cell cluster surrounded by basolateral m-CN in co-cultures. 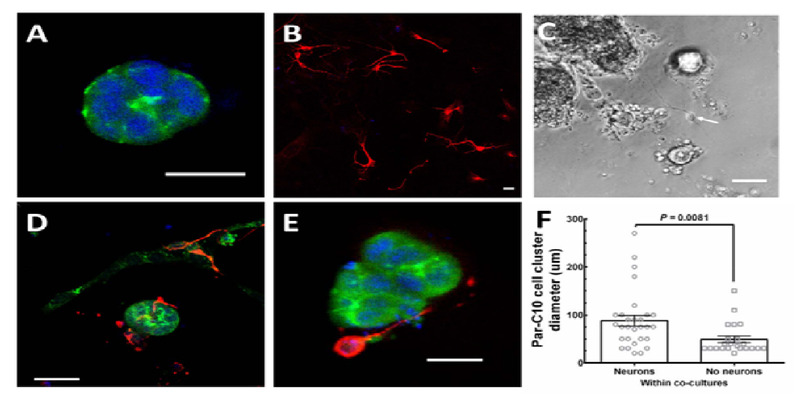 (E) For Par-C10 clusters in co-cultures with m-CN, the diameter of Par-C10 cluster with neurons (88.1 ± 11.2 μm) was significantly larger than Par-C10 without neurons (48.91 ± 6.86 μm, P = 0.0081). Bars represent mean ± S.E.M. Scale bars for (A), (B), (D), (E) are 20 μm. Scale Bar for (C) is 100 μm. Before studying functional aspects of neuron-salivary epithelial cell connections, it is crucial to understand the structural organization between neurons and salivary epithelial cells in culture. A robust in vitro co-culture model can provide an excellent approach to isolate and study factors governing neuron-salivary epithelial cell interactions. Here, we describe self- organization of neurons around salivary epithelial cell in neuron-salivary epithelial co-cultures that is similar to native tissue. Our results indicate that m-CN are able to self-organize around Par-C10 cell clusters under growth conditions optimized for Par-C10 cell growth. Self-organization has been previously observed in different types of co-cultures[26-28]. Additionally, the co-culture of neurons with other cells types, such as endothelial and muscle cells, have been shown to be achievable[7,8,29]. In summary, our study is the first to both show the feasibility of co-culturing neurons with salivary epithelial cells and to demonstrate in vitro neuronal self-organization around salivary epithelial cells similar to native salivary gland tissue. This study provides a proof of concept for a novel in vitro model to study neuron-salivary epithelial cell interactions. Many factors need to be optimized to produce a robust in vitro model capable of modeling functional connections between neurons and salivary epithelial cells. Specifically, culture conditions to optimize neuronal growth while maintaining Par-C10 cluster formation need to be further studied, including cell types utilized, plating densities, culture duration, and growth medium supplements. In this study, we used Par-C10 cells due to their ability to form polarized salivary structures. In addition, m-CN was chosen due to their commercial availability and ubiquity in the literature as a pan-neuronal cell model. Since the primary goal of this study was to describe the interactions between neurons and salivary epithelial cells in vitro, we investigated the effect of m-CN on Par-C10 cell cluster formation, but not the inverse effect of Par-C10 cells on m-CN growth and morphology. It is certainly possible that the co-culture of Par-C10 with m-CN could have unintended effect on m-CN growth, and future studies will be conducted to investigate this possibility. Additionally, the Par-C10 immortalized cell line is derived from rat parotid glands, presenting a species compatibility issue for co-culture with m-CN. While the ultimate goal of generating a fully functional salivary gland in vitro would require the use of human salivary epithelial and peripheral parasympathetic and sympathetic neurons, the use of mixed co-cultures utilizing cells and cell lines from different species is well established for the development of in vitro models[30,31]. Our results provide a basis for an in vitro model that could allow future studies of complex cell-cell interactions between different cell types of the salivary gland. Acknowledgments: The authors acknowledge Mr. Justin Easley (University of Utah, School of Dentistry, Baker lab), for his assistance in imaging some of the specimens for this study. This work was supported by the NIH-NIDCR grants R01DE022971, R01DE021697 to OJB. 1. Epstein, J.B., Jensen, S.B. Management of Hyposalivation and Xerostomia: Criteria for Treatment Strategies. (2015) Compend Contin Educ Dent 36(8): 600-603. 2. Saleh, J., Figueiredo, M.Z., Cherubini, K., et al. Salivary hypofunction: An update on aetiology, diagnosis and therapeutics. (2015) Arch Oral Biol 60(20): 242-255. 3. Villa, A., Connell, C. L., Abati, S. Diagnosis and management of xerostomia and hyposalivation. (2015)Ther Clin Risk Manag 11: 45-51. 4. Nelson, J., Manzella, K., Baker, O.J. Current cell models for bioengineering a salivary gland: a mini?review of emerging technologies. (2013) Oral Dis 19(3): 236-244. 6. Goers, L., Freemont, P., Polizzi, K.M. Co-culture systems and technologies: taking synthetic biology to the next level. (2014) J R Soc Interface 11(96): 20140065. 7. Shen, Q., Goderie, S.K., Jin, L., et al. Endothelial cells stimulate self-renewal and expand neurogenesis of neural stem cells. (2004) Science 304(5675): 1338-1340. 8. Das, M., Rumsey, J.W., Bhargava, N., et al. A defined long-term in vitro tissue engineered model of neuromuscular junctions. (2010) Biomaterials 31(18): 4880-4888. 9. Nedvetsky, P.I., Emmerson, E., Finley, J.K., et al. Parasympathetic innervation regulates tubulogenesis in the developing salivary gland. (2014) Dev Cell 30(4): 449-462. 10. Quissell, D., Turner, J., Redman, R. Development and characterization of immortalized rat parotid and submandibular acinar cell lines. (1998) Eur J Morphol 36: 50-54. 11. Turner, J.T., Redman, R.S., Camden, J.M., et al. A rat parotid gland cell line, Par-C10, exhibits neurotransmitter-regulated transepithelial anion secretion. (1998) Am J Physiol Cell Physiol 275: C367-C374. 12. Baker, O.J. Current Trends in Salivary Gland Tight Junctions. (2016) Tissue Barriers. 13. Baker, O.J., Schulz, D.J., Camden, J.M., et al. Rat parotid gland cell differentiation in three-dimensional culture. (2010) Tissue Eng Part C Methods 16(5): 1135-1144. 14. McCall, A.D., Nelson, J.W., Leigh, N.J., et al. Growth factors polymerized within fibrin hydrogel promote amylase production in parotid cells. (2013) Tissue Eng Part A 19(19-20): 2215-2225. 15. Soscia, D.A., Sequeira, S.J., Schramm, R.A., et al. Salivary gland cell differentiation and organization on micropatterned PLGA nanofiber craters. (2013) Biomaterials 34(28): 6773-6784. 16. Hopkins, A.M., DeSimone, E., Chwalek, K., et al. 3D in vitro modeling of the central nervous system. (2015) Prog Neurobiol 125: 1-25. 17. Zhou, W., Hurlbert, M.S., Schaack, J., et al. Overexpression of human α-synuclein causes dopamine neuron death in rat primary culture and immortalized mesencephalon-derived cells. (2000) Brain Res 866(1-2): 33-43. 18. Yu, Z., Liu, J., Guo, S., et al. Neuroglobin-overexpression alters hypoxic response gene expression in primary neuron culture following oxygen glucose deprivation. (2009) Neuroscience 162(2): 396-403. 19. Roth, S., Zhang, S., Chiu, J., et al. Development of a serum-free supplement for primary neuron culture reveals the interplay of selenium and vitamin E in neuronal survival. (2010) J Trace Elem Med Biol 24(2): 130-137. 20. Mellas, R.E., Leigh, N.J., Nelson, J.W., et al. Zonula Occludens-1, Occludin and E-cadherin Expression and Organization in Salivary Glands with Sjögren’s Syndrome. (2014) J Histochem Cytochem 63(1): 45-56. 21. Baker, O.J. Tight junctions in salivary epithelium. (2010) J Biomed Biotechnol 2010: 278948. 22. Karki, R., Mariani, M., Andreoli, M., et al. βIII-Tubulin: biomarker of taxane resistance or drug target? (2013) Expert Opin Ther Targets 17(4): 461-472. 23. Sommakia, S., Rickus, J.L., Otto, K.J. Glial cells, but not neurons, exhibit a controllable response to a localized inflammatory microenvironment in vitro. (2014) Front Neuroeng 7: 41. 24. Kopelovich, J.C., Cagaanan, A.P., Miller, C.A., et al. Intracochlear Electrical Stimulation Suppresses Apoptotic Signaling in Rat Spiral Ganglion Neurons after Deafening in Vivo. (2013) Otolaryngol Head Neck Surg 149(5): 745-752. 25. Knox, S.M., Lombaert, I.M., Haddox, C.L., et al. Parasympathetic stimulation improves epithelial organ regeneration. (2013) Nat Comm 4: 1494. 26. Lu, H.F., Chua, K.N., Zhang, P.C., et al. Three-dimensional co-culture of rat hepatocyte spheroids and NIH/3T3 fibroblasts enhances hepatocyte functional maintenance. (2005) Acta Biomater 1(4): 399-410. 27. Rizvanov, A.A., Yalvaç, M.E., Shafigullina, A.K., et al. Interaction and self-organization of human mesenchymal stem cells and neuro-blastoma SH-SY5Y cells under co-culture conditions: A novel system for modeling cancer cell micro-environment. (2010) Eur J Pharm Biopharm 76(2): 253-259. 28. Sun, T., Mai, S., Norton, D., et al. Self-organization of skin cells in three-dimensional electrospun polystyrene scaffolds. (2005) Tissue Eng 11(7-8): 1023-1033. 29. Menet, V., Ribotta, G.Y., Sandillon, F., et al. GFAP null astrocytes are a favorable substrate for neuronal survival and neurite growth. (2000) Glia 31(3): 267-272. 30. Bhatia, S., Balis, U., Yarmush, M., et al. Microfabrication of Hepatocyte/Fibroblast Co?cultures: Role of Homotypic Cell Interactions. (1998) Biotechnol Prog 14(3): 378-387. 31. Hussain, A., Collins, G., Yip, D., et al. Functional 3-D cardiac co?culture model using bioactive chitosan nanofiber scaffolds. (2013) Biotechnol Bioeng 110(2): 637-647.